"Now here's a hilarious book. I'd love to know where the author earned his 'World Champion' title as advertised on the cover. COVER: "Alpha Backgammon is to backgammon what The Inner Game of Tennis is to tennis," says tennis champion Ilie Nastase, who is an expert backgammon player. Here, a world-renowned champion shows you how to play a winning game and gives you the special secret of his success. The author presents a series of illustrated boards (more than two hundred) which are accompanied by comments on strategy and moves. Each play is explained in clear, concise, easy to follow steps, accessible to anyone who wants to master this fascinating board game. Vernon Ball takes backgammon through twelve successive levels, ranging from beginning through expert. You will be able to follow closely and guage your own progress as Ball leads you from one level to the next, increasing your game-playing powers at each step. 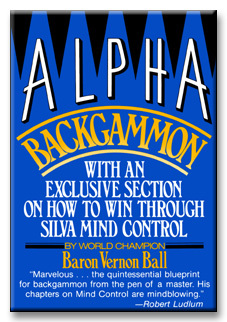 Alpha Backgammon has a special bonus that no other backgammon book offers: Champion Vernon Ball tells how he used Silva Mind Control to become the world's top player, and shows how you can use this famous method to advance your game and conquer your opponentshow you can get your mind in tune with the dice and control your luck. Ball describes the Silva Mind Control way of releasing untapped energies for beneficial uses, a method of relaxed concentration practiced successfully by millions of Silva Mind Control advocates the world over. Not since The Inner Game of Tennis has there been such a game book to prime the player to win! Alpha Backgammon includes a dictionary of backgammon jargon, a series of odds tables, a bibliography, and, for the first time in any book, the complete Black and White International Tournament Rules. AUTHOR: Baron Vernon Ball began playing backgammon in 1974. Two years later he won the World Championships, and he continues to play and win around the world, and even underwater. He is also the only person in modern times to have become a noble through the purchase of a title. Baron Ball makes his home in the Virgin Islands.